The Office of Personnel Management was able to reduce the outstanding backlog of retirement claims by 14% in March. The backlog had risen sharply in January, going from approximately 15,000 to 23,000, thanks to the annual surge of retirements that take place at the end of a calendar year. OPM processed 10,602 claims in March after receiving 7,216 new claims to get the backlog down to 20,530. At the end of last March, it stood at just under 20,000. OPM was able to process 77% of the claims in 60 days or less, an improvement over the last two months. 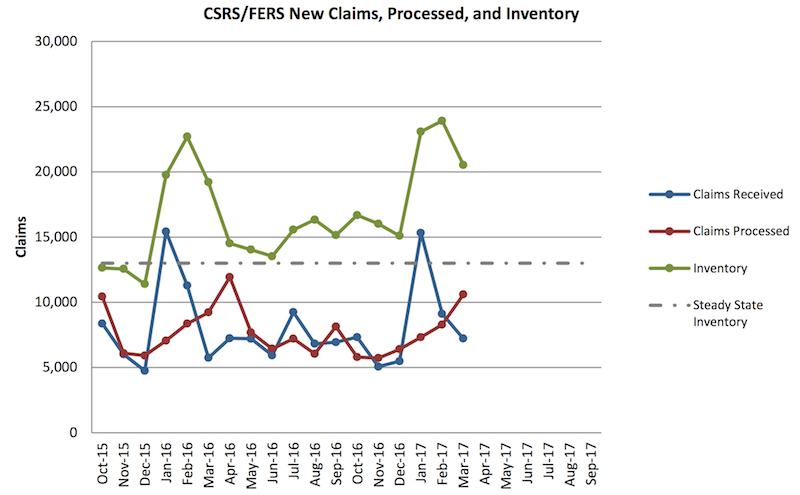 In January, only 39% of new claims were processed in 60 days or less, likely due to the unusually high number of new ones received.